The trans-Mongolian and trans-Siberian Railways meet at Ulan Ude, an Russian town of Asiatic flavor, population 500,000, where half the people look white-Russian and the other half look Mongolian. We stopped here for our first homestay. Our host, Sergie, picked us up in a dilapidated car, a Toyota Carena with the wheel on the right-hand side, and drove us on the right-hand side of the road to his apartment. He lives on the fifth floor of a rough concrete building without elevators. 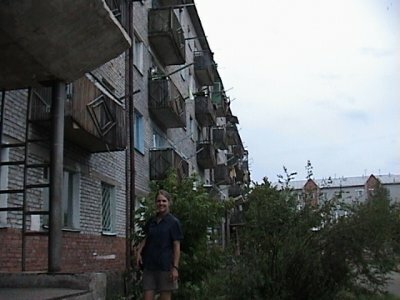 Falling plaster in the hallways and the neighborhood's impoverished atmosphere create a false impression about the comforts within each apartment. Sergei's apartment is clean and cozy, decorated in a fashion reminscent of the American sixties-style: faded wallpaper in floral designs, bright orange throw rugs that are cut-outs of wall-to-wall carpeting, and pressed wood furniture. We kept looking for a picture of the Partridge family. After breakfast we board a bus for the city center. Actually we boarded several buses since our initial attempt put us on the wrong bus. Helpful Russians noticed our lost looks and led us to the right place. All day various local people befriended us. They wanted to interact with foreigners. Two teenage boys took us to a music kiosk where we bought a tape of Mummy Troi, a famous Russian band, for 20 roubles (66 cents). Music is cheap, so we bought more tapes, Elton John and Credence Clearwater Revival; the kiosks offer wide selections. Kids we met want to join the music industry. A young girl sang to us in a nice voice and asked if we had any music industry contacts in America. Most kids asked why we visited an out-of-the-way place like Ulan Ude. "For the music," we said. 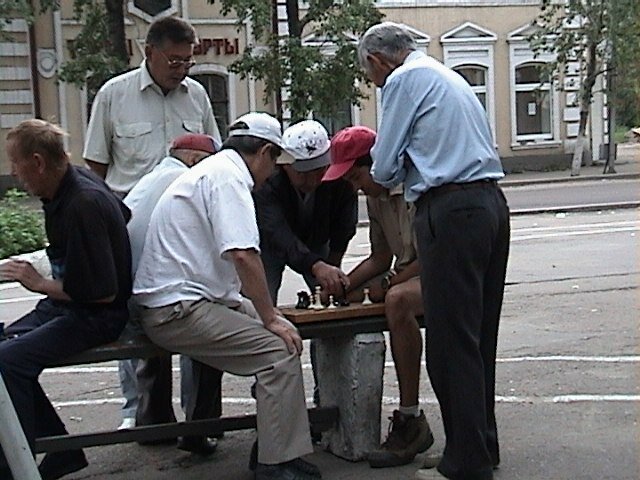 Russians are a tough chess audience. Since I was taking too long to make a move, the crowd started to help. 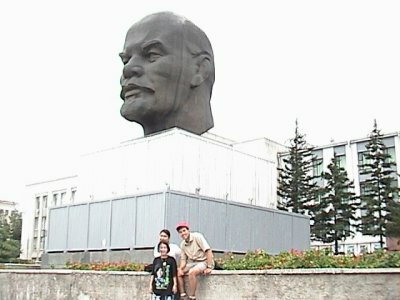 The symbol of Ulan Ude: a giant Lenin head. Russians joke that Communist propaganda attributed all good things to Lenin - including good weather.